Having virtually destroyed the Russian Second Army in the Battle of Tannenburg, Generals Paul von Hindenburg and Erich Ludendorff tried to do the same to the Russian First Army under General Paul von Rennankampf. Von Rennenkampf retreated to a line running from the Baltic Sea coast on the north to the Russian/German border on the south. The southern half of the line fell along the Masurian Lakes, where the Russian line ended on the north side of a large lake, and continued on the south side with two reserve divisions. Further south, an isolated army corps held the line near the border. Hindenburg and Ludendorf struck at these two isolated forces. On September 9, the Germans attacked the reserve units with two corps, one attack head on, the other striking the left flank, and moving through the lakes to get behind the Russian line. The Russian defenders fled in disorder. The Germans also attacked the southern outpost of the Russian line. By September 10, the Germans had taken 5,000 Russian prisoners, and had smashed the southern end of Rennenkampf's line. Realizing his army was in danger of being encircled, von Rennenkampf ordered a general retreat late on September 9. 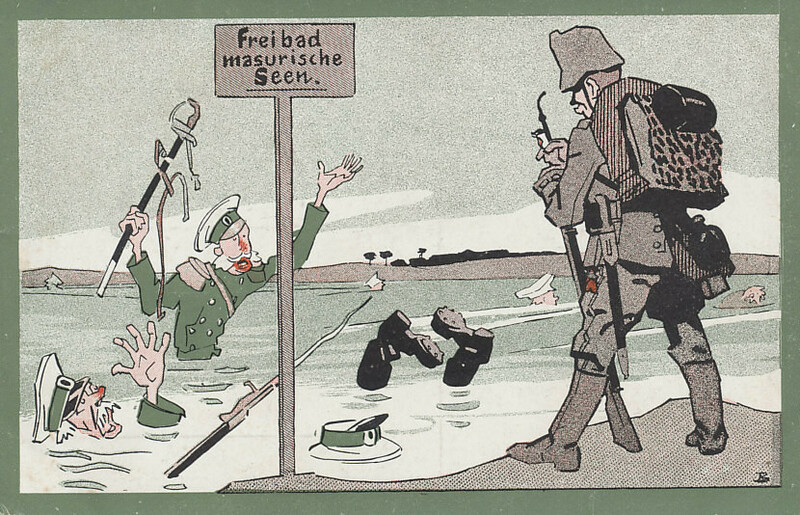 The Russians retreated to the east, more quickly than the pursuing Germans could keep up with them, marching through the night of September 9 and day and night on September 10. To protect the retreat, the Russians counter-attacked in the center of their line on the 10th, driving back the German forces, and delaying their advance which they continued more cautiously. To ensure his escape back to Russia, Rennenkampf's rear guard fought one final battle. Von Rennenkampf lost 145,000 men in his invasion of East Prussia, 125,000 of them in the Battle of the Masurian Lakes. Estimates of German losses are as low as 10,000.